More than 30 million Americans currently provide unpaid care to family members aged over 50. These carers tend to be busy. As well as supporting aging parents, who typically wish to live independently in their own homes, carers are often parents and breadwinners too. If you’re one of them, we appreciate the work you do. We’re working on new tools and technology to help you. 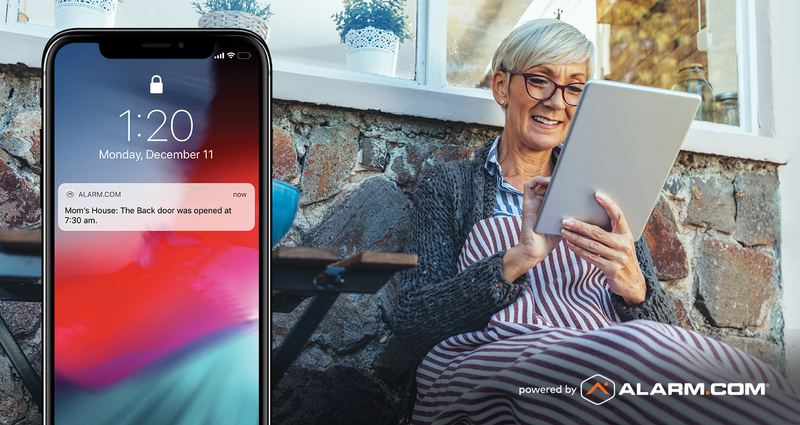 Wellness Insights, a new addition to our Wellness solution and a CES Innovation Award Honoree, helps you stay assured about a loved one’s wellbeing when you can’t be there. Using predictive analytics and Alarm.com’s activity awareness, it discreetly monitors overall quality of life, learns activity patterns and alerts you to changes that could indicate an emerging health issue—before it turns into an emergency. Using a suite of discreet, connected sensors and smart devices in your loved one’s home, Wellness Insights works by establishing a routine for behavioral patterns over the course of 30 days so that you can know about critical behavioral differences right away. While traditional independent living solutions only let you know about a problem after the fact, Wellness Insights can keep you several steps ahead. Thanks to its advanced machine learning that compares data patterns across short periods of time, you can rely on proactive intelligence and insights about your loved one’s wellbeing. Wellness Insights can also deliver proactive insights around daily living behavior, and alerts that let you know instantly if your loved one gets out of bed for a prolonged time at night, opens a door outside of normal hours, or doesn’t access their medication at a prescribed time. With its ability to detect emerging situations early, Wellness from Alarm.com redefines independent living technology as well as the wider scope of home security, offering you and your family a new tool that empowers independent living through connectedness and awareness. How Do I Get Alarm.com? It’s Easy!